The town of Bled and its lake are located northwest of Slovenia, next to the most important National Park: the Triglav. Triglav is the highest mountain in Slovenia and is including in their national flag in the shape of three peaks (Triglav means “three-headed” in Slovenian). The lake is of glacial and is surrounded by mountains. In the middle of the lake, there is a small island with a church, (the Assumption) in the center. You cans see in the picture that Lake Bled is crowned by a castle that sits on top of a cliff. It measures 125 meters. The castle is of feudal origin, has more than 1000 years. It was first mentioned in 1011, although it was not until years later when it was expanded to be the fortress that is now. The castle has beautiful towers, chapel, houses and walls, and is a must if you pass around. The visit costs about 6 euros. I recommend the evening, when the views of the lake and the small central island are even more impressive. At the church in the center of the lake you can go boating. It is more than half a kilometer from the center of Bled. The boats can be rowed or motor, in the interests of everyone, but I recommend renting a rowing as being a place surrounded by nature and so green. 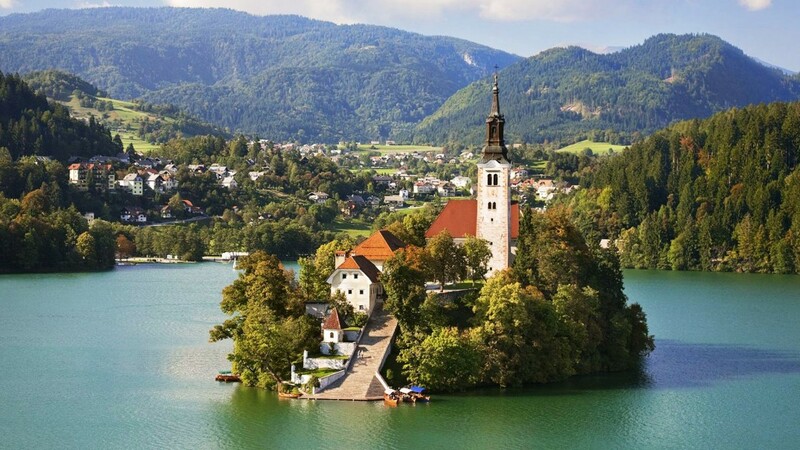 Because of the situation of the church, it is frequented by many Slovenians who will marry in Bled for what is called the most romantic island church or weddings. You may also swim in the lake, as it has numerous beaches. The water is a little cold, but it is possible, if you are in good shape swim to the middle of the lake, even to the island of the Church. The surrounding mountains make it a stunning place. 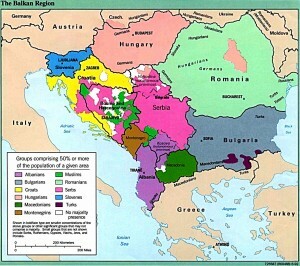 They are the Julian Alps, which unlike the French Alps, Swiss or Austrians are white, being formed of limestone. They are also characterized by very steep and quite inaccessible, although Slovenia is the national sport climbing. If you like sports tourism, Slovenia is a perfect place. In addition to the tours that you can do to make caves of Postojna, or Pivka and Black Top, you can also go trekking or mountain climbing as there are routes to all their tops. Bled is the perfect place to start climbing routes along the beautiful mountains of Slovenia place. It also offers the possibility of other sports such as cycling, canoeing or rafting, so now you will understand why I say that it is the ideal destination for sports tourism. What more can we do there? Around Bled, they are also impressive places. I recommend renting a bike to visit them. What is perhaps more accessible departing from Bled Vintgar Gorge and the hermitage of Santa Catalina. Vintgar Gorge (“Vintgar Gorge”) is a giant canyon that stretches for half kilometer along the Radovna river, ending in a huge waterfall. The throat was opened in the last ice age through the soft sandstone layer is in Bled environments. The small canyon is crossed by huge wooden walkways that allow access to all the rapids and waterfalls that make the river. The scenery is spectacular. The river, a very clear water, draws fantastic forms in its path. One kilometer away is the remote hermitage of Santa Catalina, almost as old as the castle of Bled. It is also a marvelous place surrounded by mountains. It’s a nice excursion from Bled, because the road to it is beautiful and entertaining. Other recommended excursions rather than taking advantage of the visit to Bled are its twin Lake Bohinj, which is not far away, climbing up Triglav to enjoy its colorful lakes, or visit the emerald Soca river can fascinate you. 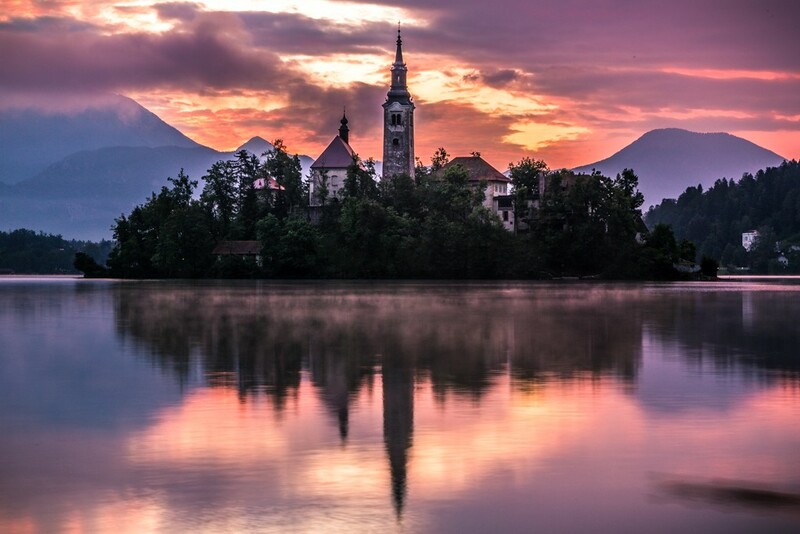 In short, Bled is a unique place in Slovenia that will leave you speechless. It seems impossible that from a castle that sits on a cliff can watch a locked church on a small island. It seems more worthy of a fantasy novel that actually exist. In any case, we strongly recommend that when you visit Slovenia, do not stay only in the capital Llubjana visit and recommend you approach Bled. You will not be sorry of visit it.